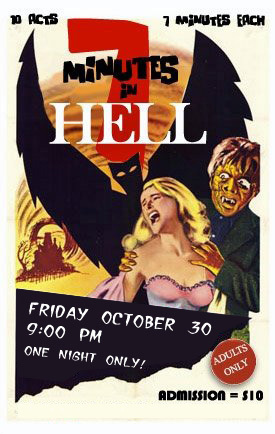 Friday, October 30th – ONE NIGHT ONLY! 7 Minutes In Hell is our no-holds-barred-anything-goes-Halloween-variety-show! At each 7 Minutes show, we open our stage to local performers, who each get 7 minutes to do whatever they want. We don’t ask them what they’re going to do, and they don’t have to tell us. Each 7 Minutes show is just as much a surprise to us as it is to the audience! What can you expect to happen at a 7 Minutes? Here are a few of the things we’ve seen at 7 Minutes over the years: spoken word, musical numbers, sketch comedy, standup, interpretive dancing, dinosaur burlesque routines, competitive doughnut eating contests, action figure battles, musical rubber chickens, naked stage magic, heartbreaking true life storytelling, arm-wrestling, live drawing, group hugs, sleight of hand, improv and more. So much more. Please note: 7 Minutes is NOT a family friendly show. Leave the little ones at home.